Mixing it up in the kitchen is not limited to cake baking! This month in the Kitchen Trends Blog we’re looking at kitchens that refuse to be limited or defined colour, style or design. These ‘mix & match’ kitchens combine different colours, styles and finishes within the kitchen itself, going further than simply adding contrasting colours to the walls or patterned tiles to the floor or splashback. True mix & match kitchens have clear points of difference within the cabinets themselves, creating unique looks and challenging the constraints of typical kitchen design. There are a few ways that you can do this; some are quite subtle and some are definitely bold in nature. The easiest way to add interest is to specify the same kitchen range but include 2 or more different colours in the doors/drawer fronts. You can choose to assign different colours to clearly separate areas, effectively creating ‘zones’ within the design, or break up the flow by interspersing a coloured door between blocks of the contrasting colour. Traditionally, kitchens have vertical base and wall cupboards and horizontal drawers. This is no longer the case with deep drawers being used for pans and plates and wall units with horizontal fronts and a range of opening mechanisms including top hinged and bi-folding doors (see this in our predictions for 2016 kitchen design trends). Sticking to all horizontal or all vertical will give you a sleek design but mixing the two creates different forms and adds character. As kitchen manufacturers become more adventurous in the materials that they use you can opt to go for a whole scheme that is really progressive in terms of design or tone that look down by combining traditional materials with more unusual ones such as chipboard, metal, chicken wire and reclaimed timber. A more subtle way of creating something different than contrasts in colour or material is in using texture as a design tool (again, texture is tipped to be popular in 2016). Colours can match or remain neutral but the point of difference is established by combining different textures on cupboard doors and drawer fronts. We have added all these ideas, plus lots more to our accompanying Mix & Match Kitchens Pinterest board so do go and check those out). If you have created a unique look through a ‘mix & match’ kitchen then why not post your photos on our Facebook page or leave your comments here? If you’d like more ideas, designed for your own kitchen then get in touch to arrange a free design consultation. 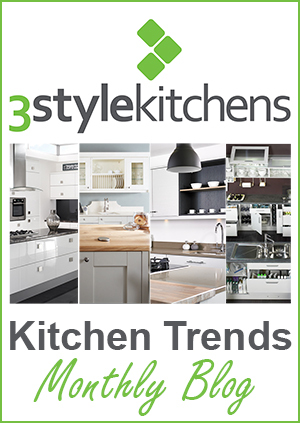 Our next Kitchen Trends blog will be posted on 1st March. In the meantime keep checking back for other posts and news or follow us on Facebook or Twitter. 0 Responses to "Kitchen Trends Monthly Blog – February "